One of the premier band programs, the Marching Southerners, woke up to devastating news this morning after a series of tornadoes stormed through the Jacksonville State University campus last night. We have been able to confirm that no staff were killed or severely injured in the tornadoes, but some of their homes sustained damage. The real damage though was felt at university housing and buildings across campus. Caleb McDonald, a sophomore at JSU and member of the Southerners, has been reporting to us from the scene all morning. He has told us that Mason Hall, the Music Building, has extensive roofing damage which caused the building to take on a lot of water. The band room is in very rough shape and may be unsalvageable as well as offices and classrooms. The Southerners also have a practice field which looks to be in pretty good shape with the Director's tower and storage facility taking on minor damage. Many band members are very concerned about the prize jewel of the Marching Southerners, their beloved 20J's (marching tubas). They are housed in Mason Hall and as of publication we have not heard whether or not they made it through the storm. Luckily students are on spring break so those injured on campus is quite low. Although many will be returning to JSU this weekend without housing as multiple student dorms and housing facilities were completely destroyed. 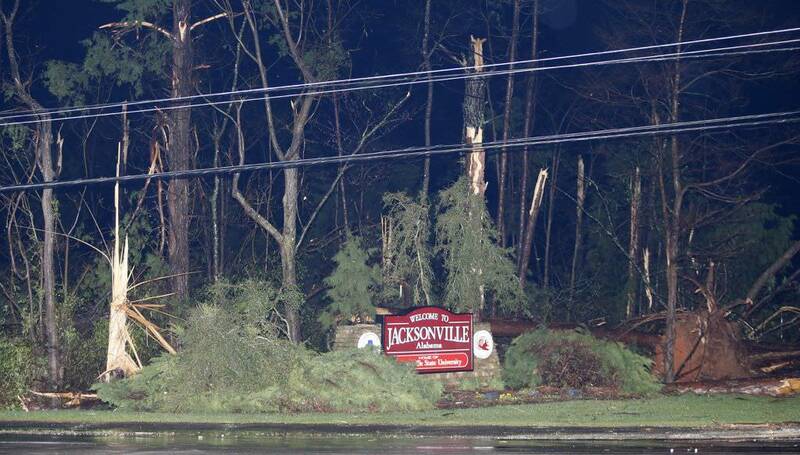 NEW: Sunrise reveals the extent of reported tornado damage on the Jacksonville State University campus in Jacksonville, AL. This is a developing story and we will continue to update this as we get more information.